We all lose muscle as we age, and we’re not talking the decline of middle age. Muscle mass begins to wane as early as 20. The fast-twitch goes first, followed by the slow-twitch, which makes sense since most of us are better at endurance than speed as we get older. In an effort to lose weight, many of us think cardio is best, and give less of our attention to resistance or weight training. 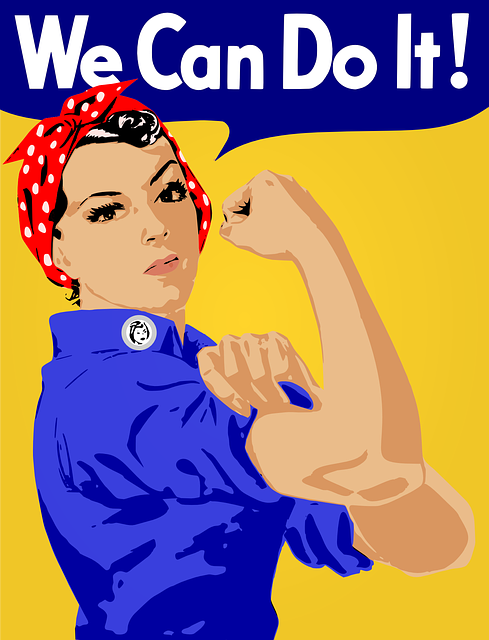 But it’s important to stay strong, and reap added benefits to our waistline and health. As we age, when we gain weight, we gain it as fat. When we lose weight, half of what older adults lose is muscle. Research has shown that strength training is more effective than cardio at melting away intra-abdominal fat (aka belly fat that surrounds our organs). Besides being aesthetically undesirable, belly fat is linked to heart disease, diabetes, and some forms of cancer. When we stop exercising we lose muscle rapidly. The good news is that we can gain most of it back in as little as 3 months. Strength training boosts metabolism. Since muscle is metabolically active tissue, the more muscle you have, the more calories you can consume without gaining weight. (For every 10 lbs. of lean muscle, you’ll burn an additional 25-50 calories a day.) The shift in metabolism some see as they age is partly due to gradual muscle loss. Joint pain and connective tissue problems (aching knees, shoulders, ankles, hips) are pretty common complaints. When we build muscle we also strengthen our connective tissues, keeping our bodies balanced, strong and less susceptible to aches and pains. Resistance training combats bone loss because weight-bearing exercise increases bone mineral density. In fact, exercise is better than osteoporosis drugs for offsetting bone loss. This is true for athletes as well as sedentary folks. Since falls are a growing concern as we age, staying strong protects our bones if we topple. In order to maintain your current level of strength, you only need to do resistance training one day a week. To build strength, give your muscles a workout 3x a week. Do 3 sets with 8 reps each set, lifting enough weight to bring your muscles to exhaustion. Better to not be able to finish your sets than to breeze through them because you’re not challenging your body. You may be thinking this all sounds too complicated. You don’t know how to use those machines. Maybe the weight room intimidates you, or you don’t belong to a gym. Sorry to say those excuses won’t fly, because you can fit ten minutes of strength training into your day almost anywhere with little or no equipment. Support your body on your toes and forearms, keeping your shoulders directly above your elbows, and arms shoulder-width apart. Your head, neck, back and legs should form a flat, straight line. Keep your core and legs engaged and hold the position for 30 seconds, breathing normally. Repeat every day, increasing the time little by little. By challenging your body, you’ll be impressed how quickly your plank time increases. Muscles worked are primarily the abdominals and the erector spinae (running the full length of your back), Shoulders, chest, and the thighs also benefit. Remember, small changes stick. Don’t revamp your routine all at once. Instead add or increase strength training bit by bit. Stay strong and live long! American College of Sports Medicine, Resistance Training and Injury Prevention. American Fitness, “Getting Older, Day by Day,” by Nancy Clark, MS, RD, CSSD. March, April 2014. Women’s Health Magazine. The Best Strength Training for Women: You may be missing out on the best body shaper exercises out there. by Lauren Aaronson. March 9, 2009. I regularly find amazing recipes on the blog Simple Veganista. I tried this one, doubling it for dinner for six, and hoarded the leftovers since it seemed to taste even better two, three days later. I had attempted roasted chickpeas before. I’m hooked! Prepare cauliflower and chickpeas, toss together in a large roasting pan with 2 tablespoons of olive oil and dash or two of salt. Roast for 45 minutes, stirring every 15 minutes or so. In a medium pot, add quinoa, water and a pinch of salt. Bring to a boil, cover, reduce heat and simmer for 15 minutes. Remove cover and let set 10 minutes and fluff with a fork. In a small bowl, prepare your mustard dressing and set aside. As the original recipe suggested, I doubled the dressing recipe and added a little extra to each portion. Once roasting is done, let cool a few minutes. 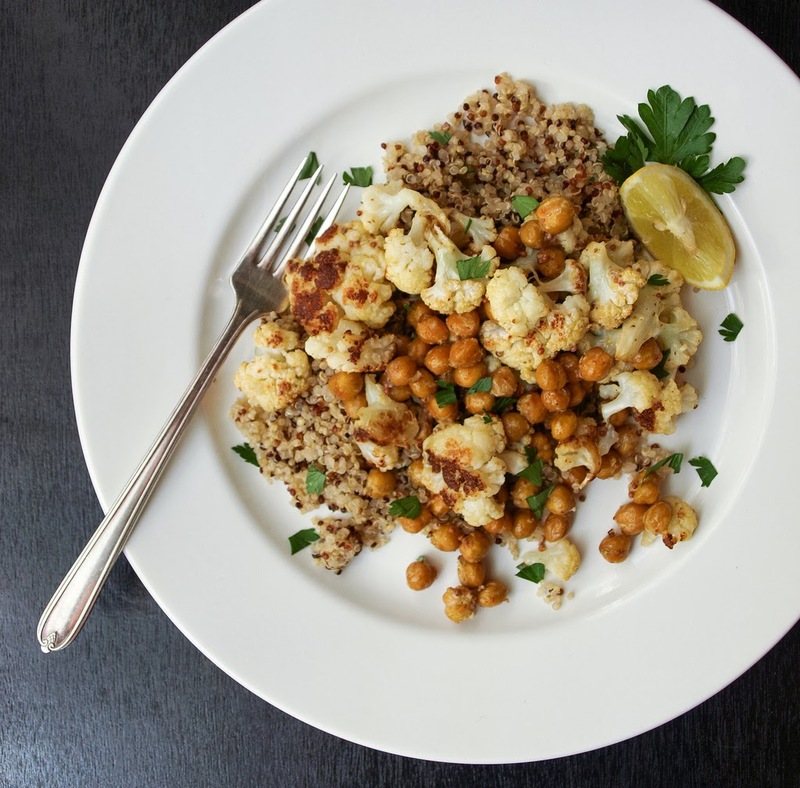 While still warm, place cauliflower and chickpeas in a medium size bowl, add dressing and toss. Add in parsley last. Tastes great warm or at room temperature. I visited my sister this spring, and she taught me how to make almond milk. This is one of those recipes that has quickly become part of my regular rotation. I like it mixed with coconut water. It’s a perfect post-workout snack since it has protein and electrolytes, and it’s not loaded with fat or calories. 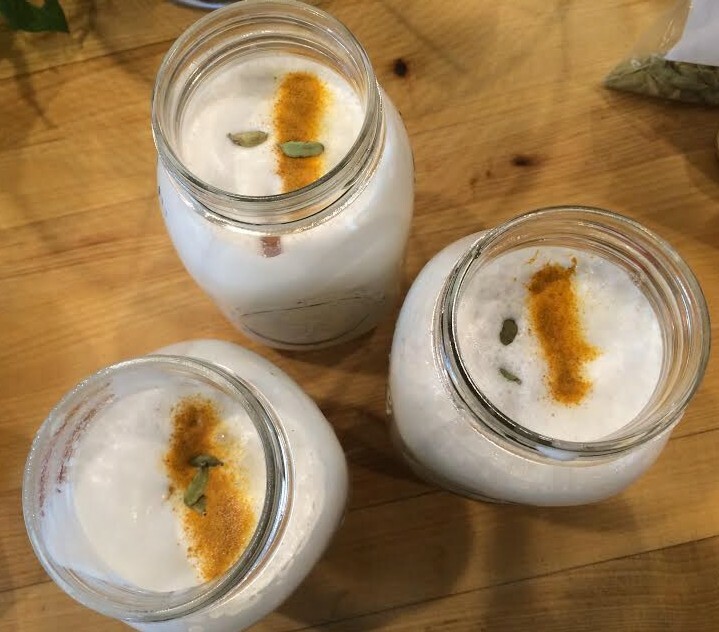 If you’re already a nut milk drinker, you’ll love it! The homemade version is so much tastier and helps you avoid the gums, thickeners, and stabilizers of packaged varieties. My sister uses her Nutribullet to grind the nuts. A Vitamix is another great option. My blender is not up to the task, so I use my juicer. Either way, almond milk is kinda messy to make, but worth the clean up! 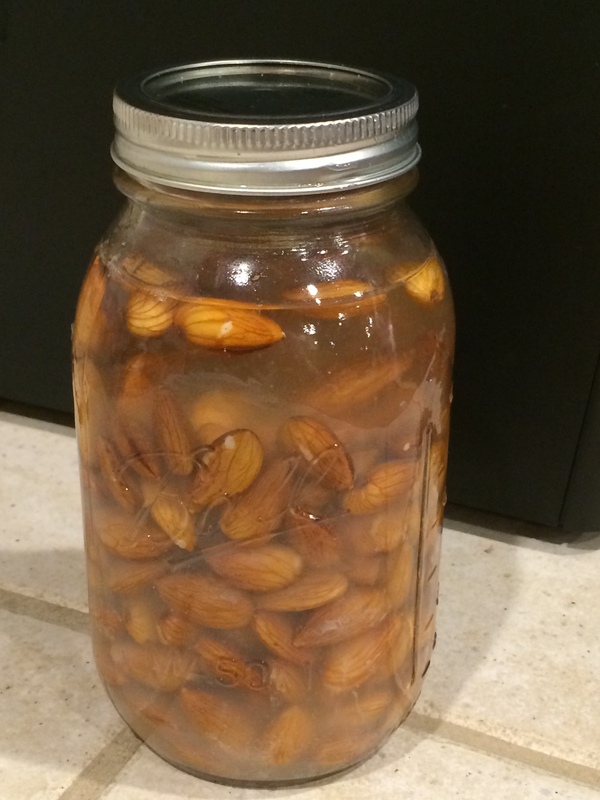 Soak the almonds in a Mason jar overnight, or for at least 10 hours. Drain the water, rinse the almonds, and fill the jar with fresh water. If you’re using a powerful blender instead of the juicer, be sure to blend on high speed until you’ve gotten a nice smooth consistency. You’ll want to add more water as you go. Run the milk through a nut bag or cheese cloth to separate out any bits and skin that remain. You can also use a metal sieve and the back of a spoon to move the liquid through the mesh. Divide the milk into Mason jars. Spice each jar with a small pinch of salt, a small dash of turmeric, one cinnamon stick, 3-4 cardamom pods, and 1-2 tablespoons of maple syrup or your favorite natural sweetener. Allow the mixture to chill. It keeps for about 4 days. Make a smaller batch if you won’t plow through it as fast as we do. Use it in your coffee instead of a creamer. Trying to ween herself off of half-and-half is what prompted my sister to come up with this recipe. It worked! Combine one part almond milk with 2 parts coconut water, over ice. So refreshing! Warm it up and add more spices for a great nightcap. It’s hard to be precise here because the milk can be different concentrations. Batches from this recipe are similar to 2% milk. If you want a thicker consistency, run it through the juicer only once, or if you’re using the blender, add less water. An 8 ounce glass of UNSWEETENED almond milk has about 1 g of fiber, 30-40 calories, and 2.5-3 grams of fat. Almond milk is a great source of protein, calcium, iron, vitamin E, selenium and magnesium, and heart-healthy monounsaturated and polyunsaturated fats. For more on what my sister is up to (she’s a talented writer and teacher), check out her website.